If you experience any negative flavours, find them on the map (left). Those flavours are now the center of the compass (right). Find the direction you need to travel in order to get back in the green. When you brew the next cup, do whatever that arrow says. Enjoy, and please let me know how you go! – take into account that your coffee might be of poor quality or roasted badly. – care about brewing temperature. Just use boiling water. If you found this useful and want to enjoy delicious coffee with the rest of the community – register for our monthly Superlatives coffee subscription. Or if you just want to keep up with every thing Barista Hustle – sign up to the Newsletter. I just started grinding my coffee beans to get a better cup of coffee at home. 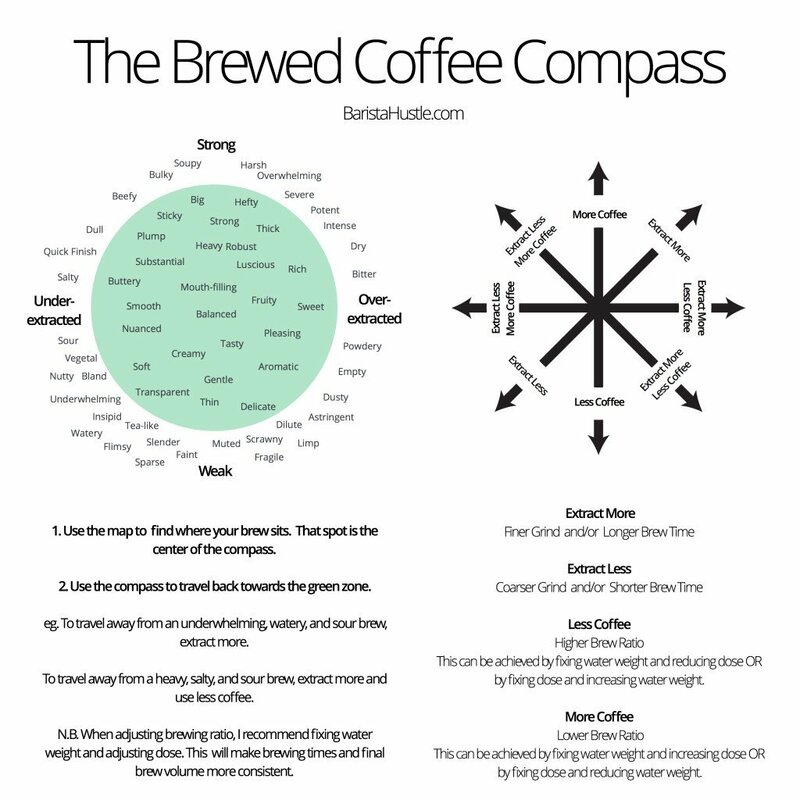 I use the Baratza Encore and their grinding tips directed me to this Coffee Compass. What an excellent tool to dial in a brew. It only took me two adjustments to get a well balanced cup that is smooth with a long nutty finish. There’s nothing like getting a fresh cup from my local coffee house, Willoughby’s in New Haven, CT, but when I can’t my home brews are a close 2nd now. As matt pointed out before, by the time your boiling water makes it to the grounds, it’s not boiling, and even if it was, you can’t burn the beans that have been roasted to a much higher degree. What i’d like to know, is if there happens to be certain unwanted compounds that only extract at that high of a temp? And further more can we plot what compounds are soluble at what temps. Or does water off a boil simply extract more quickly. I like the consistency of using water right off the boil. Do you really recommend boiling water for drip (percolated) coffee? I don’t know of a single commercial brewer with water that hot or winning Brewer’s Cup or Aeropress recipe that uses boiling water. amazing, helpful and simple, looking forward to seeing one for espresso too. Thanks! Just boil your water and use any recipe. Doesn’t need to be any more complicated. Clear and useful, thanks a lot for a great job! Best chart on brewing yet! Thanks, Matt! Hi, I am a home brewer and am a little confused by the combination of “extract more, less coffee” at 3 o’clock and “extract less, more coffee” at 9 o’clock. Is that saying that for example that you should extract more by reducing dose? Can’t wait to hear the results of your experiment. Thanks in advance and good luck! If it says both, do both! John, increasing the dose is one variable, grinding coarser is a second variable and a shorter brew time is a third. You can get a lower extraction with more and coarser coffee because the water will not dwell as it percolates though. What the coffee expert was potentially speaking to was the fact that to keep the same TDS yield/extraction with less coffee you can grind finer, but that will lead to over extracted coffee; the astringent flavor in Matt’s lower right quadrant. It may still be “strong” though. Hi Matt, what if my brew has qualities on the opposite sides of the map (e.g. dull and bitter)? Where should I go on the compass? Did u have achieve mouthfeel and balanced with handgrinder?? This one’s really tough to describe in two dimensions… but I’ll try! Doesn’t the temperature of the water count in extraction? (FYI I’m a novice beginner home brewing). Hahahahahaha! Frogpot! Took me a few seconds. I almost googled it ??? it does. The hotter the water, the more you extract. Some people try to fix and tweak their water temperature, but generally it is good to stay between 94°C and 85°C.